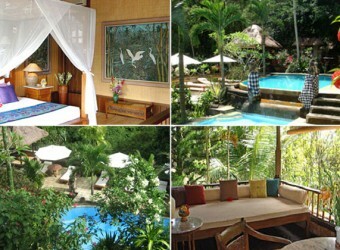 Bali Hotel The old-established restaurant in Ubud, Cafe Wayang, runs Alam 3 hotels. Alam Indah is opened in 1995. It locates 10 min. walking in the deep forest along valley from Monkey Forest of the south Ubud. In the hotel, it's Balinese atmosphere with growing tropical plants. Staffs with traditional costume welcome guests.